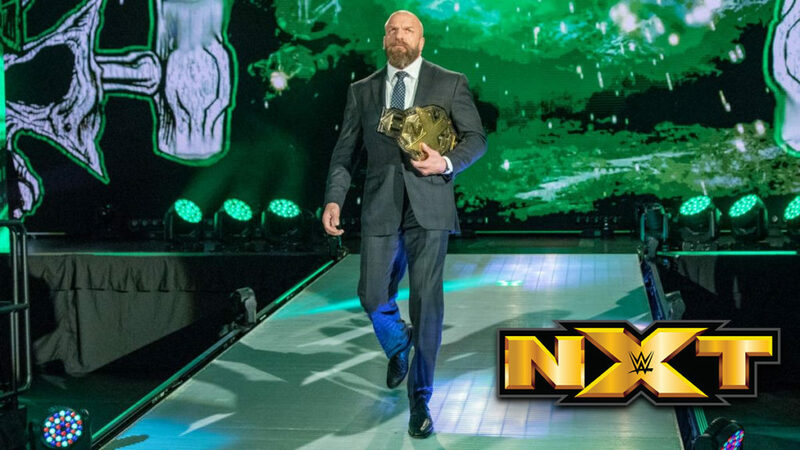 Triple H heads to the ring, and he’s carrying the NXT Title. Triple H says he doesn’t need to remind everyone how special NXT is. NXT is where dreams become possibilities. For some people, realizing those dreams can take a long time, and for others, that dream can come to an end. Triple H says he was going to announce an NXT Title match for Takeover between Tommaso Ciampa and Johnny Gargano. However, Tommaso Ciampa has been forced to relinquish the NXT Title due to having neck surgery. When one dream ends though, another dream begins. Gargano will still compete for the title, and his new opponent will be decided in a Fatal Five Way match tonight. Cathy Kelley asks Kona Reeves for a reaction to tonight’s announcement and main event. Reeves thinks it will be alright. The Forgotten Sons walk by, but they don’t care about tonight’s main event. They’re more interested in next week’s main event when they’ll compete in the finals of the Dusty Classic. A look at Ricochet and Aleister Black. Even though they’ve formed a team, they know it’s every man for himself when they compete to earn the opportunity to challenge for the NXT Title. Velveteen Dream sees that the biggest spotlight at Takeover is made for him. A look at Tommaso Ciampa’s recent successful neck surgery. Matt Riddle is stoked that he has a chance to qualify for an NXT Title match at the biggest Takeover of the year. Adam Cole is going to make history. Cathy Kelley asks Kairi Sane and Io Shirai about their upcoming title match. Kairi and Io both want the NXT Women’s Title, so they will compete against each other, but they will remain friends regardless of the outcome. Bianca Belair walks up and says she would have beaten Shirai if not for Shayna Baszler. Belair also says she is going to go through both Kairi and Io on her way to becoming champ. Great match! The pace was extremely high throughout the entire match. I think Matt Riddle really stood out. He seemed to be the most focused on inflicting as much damage as quickly and efficiently as possible while going for submissions every time he had the opportunity. Everyone else looked great too, each in their own ways. I am very happy with the outcome. Really, I would have been happy with any one of these five guys in an NXT Title match, but I’m REALLY happy with who actually won. This entire show was devoted to the Fatal Five Way and the NXT Title situation. It felt like a special episode for that, and I enjoyed it. Maybe match of the week/month. We shall see.